NanoSound provides essential functionalities including Media Control Buttons, Display, Remote control and Pi Power Switch, all in one package. This convenience give you a true consumer electronics experience, while keeping the full customization and flexibility of Raspberry Pi. 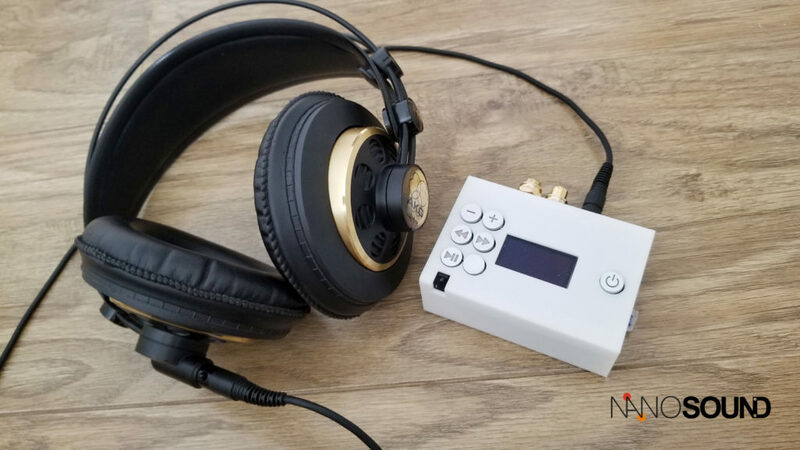 NanoSound was successfully funded via kickstarter and delivered in October 2017. An Speaker & Headphone Amp add-on is also available. Last edited by nanomesher on Wed Mar 07 2018 13:07, edited 2 times in total. Just wanted to say thank you for the great email support that NanoMesher has given during my installation process. The DAC is up and running with very smooth sounds. I hope NanoMesher will update it's plug-in to take care of this issue soon. The LED displays works for my own music files, but not for Spotify. Not sure if any future plug-in upgrade would take care of it as well. Note: The volume from the 3.5 mm jack on board of the NanoSound DAC is just enough for 32-ohm headphones (and is on the weak side). I have just placed an order for a NanaSound Amp^2 for my headphones with higher impedance. All in all, I like the sound coming out of the NanoSound DAC. To my ears, the extreme top appears to be tamed and controlled, behaving a bit like good sounding tubes. The mid and low are quite pleasing for the kind of music I listen to (Jazz and Classical). With a Linear PSU feeding the DAC, the noise floor is very clean. I could hear a pin drop in the concert hall. And it's that much of details that this DAC is rendering. Thanks John for the comment and glad that you liked the sound! We have just figured out the problem after working with Volumio developers. 1) There is a bug in the volumio 2.285 wizard after the upgrade. The workaround now is actually easier now , there is no need to edit any file. - if you accidentally ran the wizard, go to playback options, switch off i2c , reboot, switch on i2c again and resetup your DAC. Volumio is working on bug #1 above and NanoSound is working on bug #2. I have an issue with music coming out of only one channel on Nanosound DAC. Hi, have you tested both 3.5mm and RCA out? Is it the same? nanomesher wrote: Hi, have you tested both 3.5mm and RCA out? Is it the same? Yes it is the same on both outputs. We will contact you separately about this issue for diagnosis. thanks very much. nanomesher wrote: ... Volumio is working on bug #1 above and NanoSound is working on bug #2. Just upgraded to 2.295 via Volumio's web UI. No issues at all. NanoSound is running once I have the correct DAC selected. Thanks for fixing the bugs. I have my new system of DAC + the AMP^2. The DAC runs fine if I run the output though an external amp. However if I plug my Bowers & Wilkins P5 into the Amp^2, the sound is terribly distorted at 60% volume and not especially loud (i.e. only a little louder than if I plug into the jack on the DAC - and its sound doesn't distort at even at 100% volume). Any idea why the AMP seems to be so underpowered?